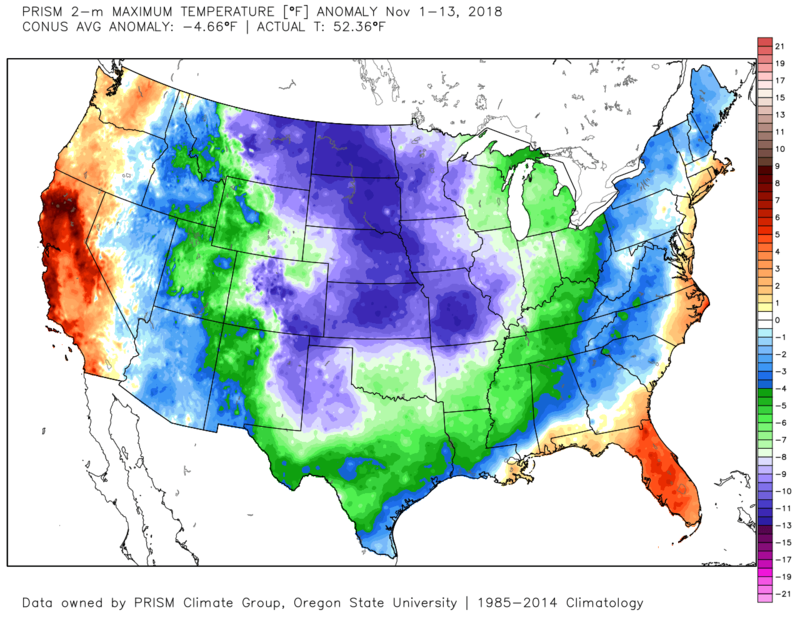 November has been a very cold month across much of the USA, but not west of the Rockies! We are running a few notches above average in the Pacific Northwest. The reason is that we continue to see a weak/splitting jet stream or occasional upper-level ridging overhead. This has been the case since at least early October. Let’s go forward through the next week and you’ll see what I mean. Here’s the 300mb (around 30,000′ up) chart for today. A classic “El Nino Winter” split flow. A “bowling ball low” is sliding by to our south leaving us dry. Tomorrow a weak system approaches from the west and moves directly over us Saturday. This drops snow levels below the passes and brings cold showers to the lowlands of Western OR/WA the next two days. Note the strongest windspeed is well to our south, so we don’t get a massive soaking or any stormy weather; just cold showers plus maybe 6-10″ snow in the Cascades. 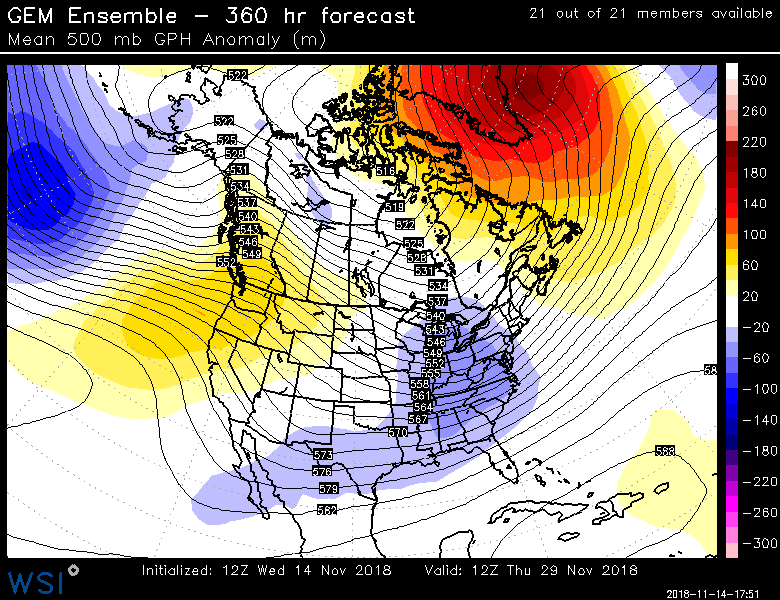 By Monday an upper-level ridge is developing again…while another one of those “bowling balls” is getting ready to slide by to the south. By Wednesday, California gets another wet (white in mountains) system, possibly aimed more for the southern part of the state. Over us the upper-level ridging is holding strong, but centered well offshore. The result is this surface map for Monday; cold high pressure has settled in for an extended stay east of the Cascades. Chilly east wind is already blowing in the Gorge by that time…brrr! By Wednesday it’s firmly entrenched. Huge east wind through the Gorge; winter-strength gusts with highs only in the 30s (icy waterfalls?). Temps peak only around 40 or so east metro and mid 40s for the rest of us. That dry air will keep us clear so calm areas drop into the upper teens next week (Battle Ground, Hillsboro, Scappoose). It isn’t an arctic freeze coming, but you should have your irrigation systems drained by now anyway. 6-10″ snow will fall at ski resorts, but then it’s possible no new snow after that until at least NEXT weekend. IF MOISTURE RETURNS FROM THE SOUTH AT SOME POINT LATER NEXT WEEK? Cold air would assure freezing rain or snow in the Gorge and Eastern Oregon. Of course a “perfect” lineup of moisture plus cold air could bring that threat into at least the eastern metro area. I’ll be watching that VERY closely. There is no sign of a typical stormy weather pattern ahead; it’s possible we have begun a “drier & milder than normal” El Nino season. We have a very warm system offshore right now; a typical “atmospheric river”. It will send plumes of subtropical moisture into Washington and Vancouver Island the next 24 hours, leaving most of Oregon dry until around sunset Monday. Enjoy your dry Monday! For many of you it’ll be warmer (mountains, coast, valley), but in the Gorge and Portland metro area we won’t warm much due to a low-level easterly wind inversion. That wet system moves onshore tomorrow night and Tuesday morning. We should see about an inch of rain out of that system plus the post-frontal showers Tuesday. The mountains see all rain through early Tuesday, then go back to a rain/snow mix depending on elevation. There are hints that Tuesday morning/midday could see very active convection with models showing below zero lifted index, plus abundant CAPE. Similar setups in the past have produced funnel clouds and/or weak tornadoes. Not a guarantee we’ll see either of these of course; the point is that the weather setup is similar to those past events. Beyond Tuesday, the Pacific jet stream becomes a bit more “confused & splitty”. By that I mean models are all over the place with locations of upper-level and low-level low pressure areas. Generally systems are weak with lots of energy headed south into California instead of the Pacific Northwest. 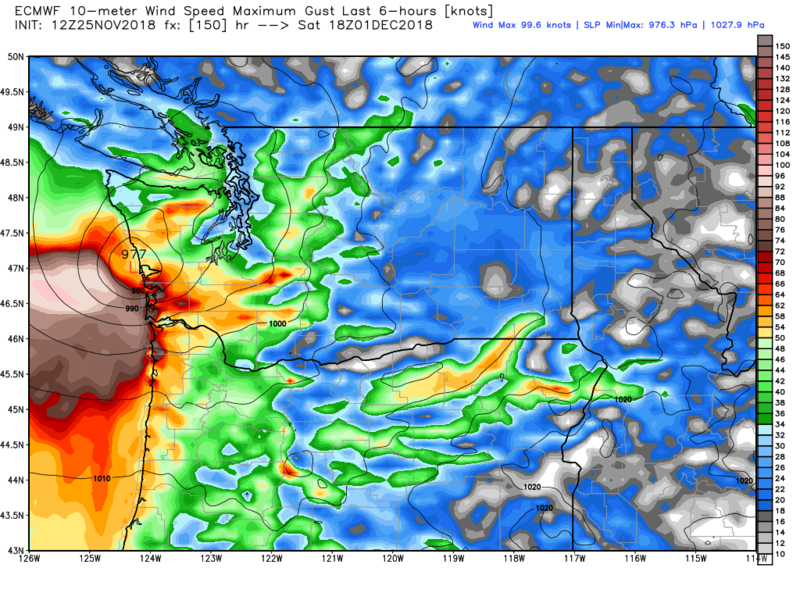 The 12z ECMWF model run decided to produce a big windstorm for NW Oregon and SW Washington this coming Saturday. See the 976mb low at Ocean Shores? Of course I immediately checked the ensemble members. As I expected; only 9 of 51 members imply any sort of strong wind Saturday at Astoria. Any of the yellow/red blocks are wind gusts 50 mph or higher. So we can dismiss that idea for now. 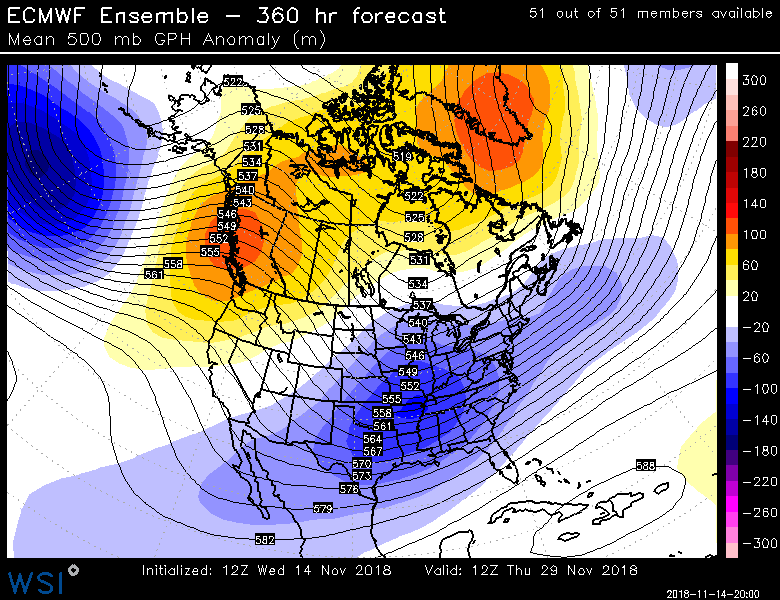 As meteorologists we should always be looking at (and forecasting from) those ensembles instead of just one operational run. Other than some rain at times, and some additional mountain snow at the end of this week, things look pretty quiet. November is going to go down as a dry one with temperatures near normal. Quite an uneventful start to our stormy season don’t you think? Now it has shifted a bit closer to us as well as warmed a bit (compared to average). 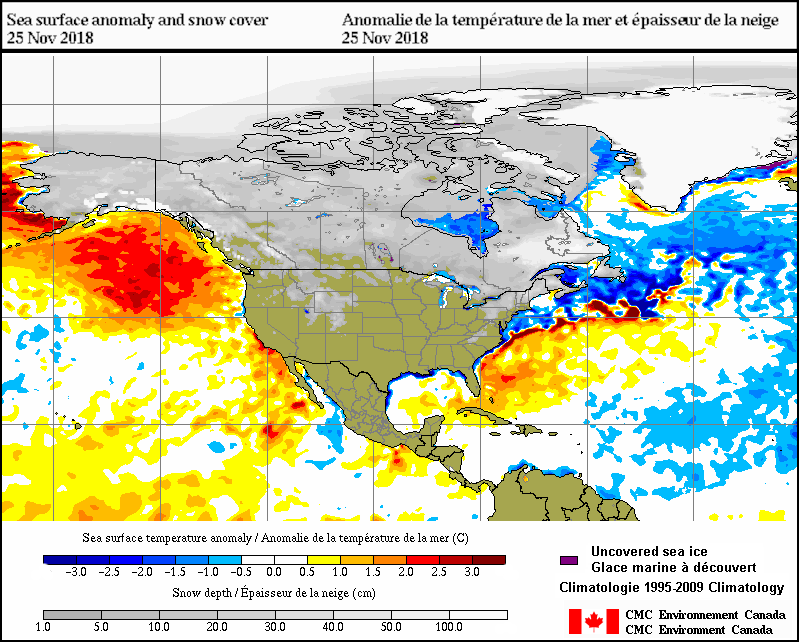 At this point all of the northeast Pacific from the West Coast to about 1,200 miles offshore, then north to Alaska, is running warmer than average. What effect that has on our winter weather I don’t know, but it sure won’t help in marginal snow situations when cold air pours out of Alaska and heads toward us over the ocean. We’ll see. Snow levels will not go below 3,000′ from the Cascades westward which means I-5 north to Seattle plus south all the way into California should remain clear. 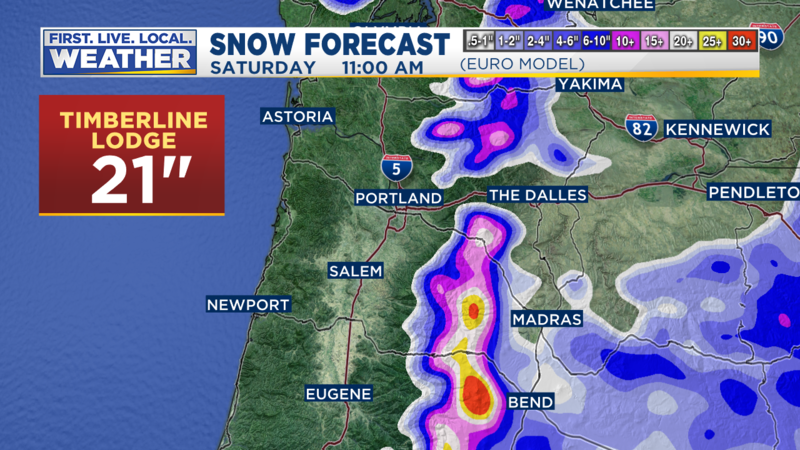 Siskiyou Summit at the Oregon border is about 4,000′ but I don’t think snow will get quite that low down there. Coast Range summits are below 2,000′ so just bare roadways there as well. 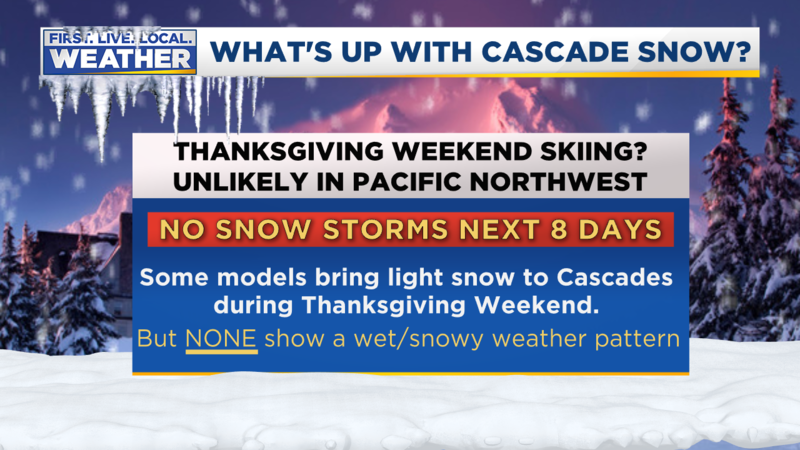 Travel conditions through the Cascades will be just fine through Thanksgiving Morning; no snow on the roads if you’re travelling duringthe next two days. Then cooler air pours in Thanskgiving Day giving some slushy areas to the passes. 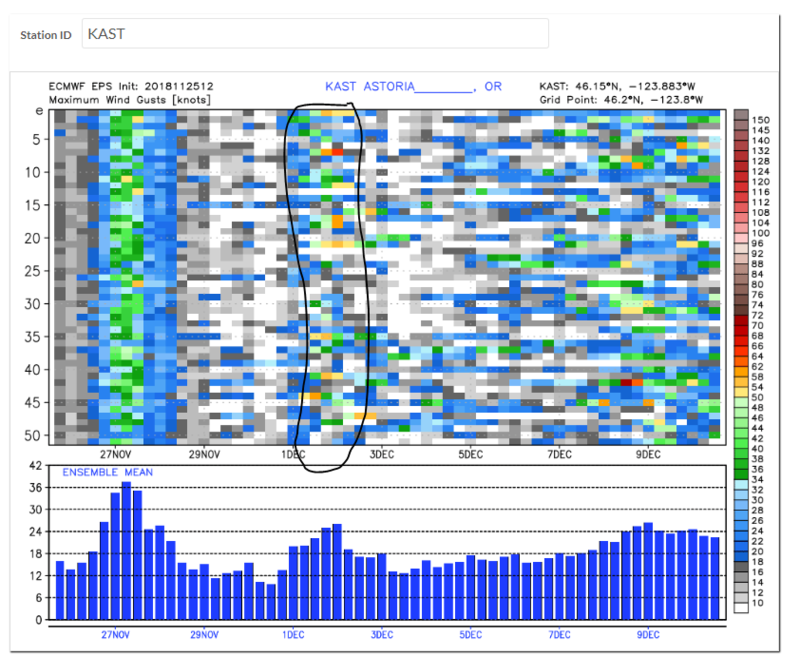 Cooling temperatures should turn the passes totally white/snowy Thursday night. 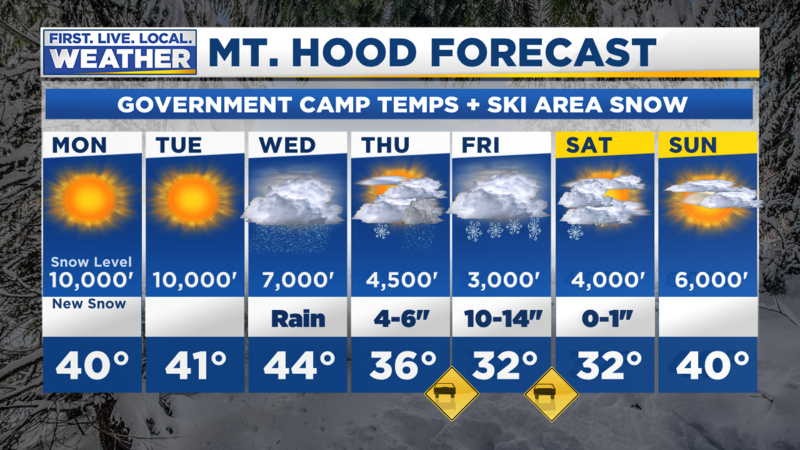 There could be snow-covered passes anytime Friday through early Saturday, but in the middle of the day it might not be so bad at Government Camp. That would be the best time to travel. Beyond Saturday morning conditions should be MUCH better. 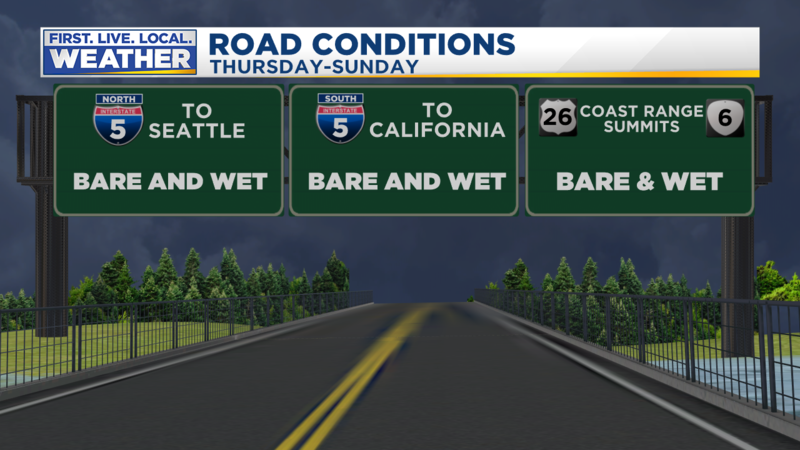 If we get lucky just mainly bare roads later Saturday and Sunday with warming & drying. After Wednesday, the best travel over Cascade passes will be Sunday; likely just bare roads. The Gorge forecast is easy…no freezing rain or snow. It’s possible we get a few spots of freezing rain in parts of the Hood River/White Salmon valleys early Wednesday, but even that won’t last long. Definitely nothing at freeway level. Now the Blue Mountains are a different story. Much of Thursday should be okay, but the cold front arriving very late in the day could turn I-84 snowy over Emigrant Hill/Meacham areas by sunset or so. Heavy snow may fall at times during the day Friday in the same area. Other than light snow showers, I think you won’t encounter any huge issues farther east through La Grande, Ladd Canyon, or Baker City. Of course overnight icy spots are possibly Friday through Sunday from leftover moisture on roads. In general travel looks relatively good this long holiday weekend. But it’s early in the season; usually we have more issues with Christmas travel. 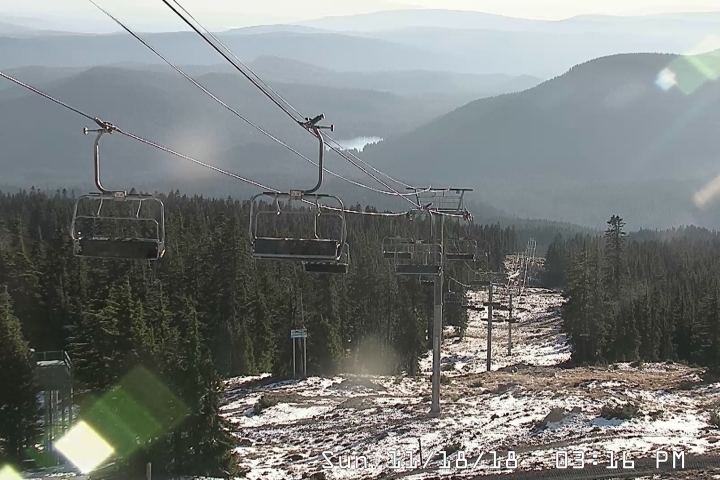 Mountain Snow Ahead; Enough to Open Ski Areas? What a fantastic weekend eh? I can’t remember a November in which we saw two consecutive sunny weekends! Sure the east wind was cranking yesterday across most of the metro area but today it has been confined much closer to the Gorge. It’ll stay that way through Wednesday. Gusts 35-45 mph far east metro and 60-75 mph in the western Gorge. Strongest wind is likely Tuesday. 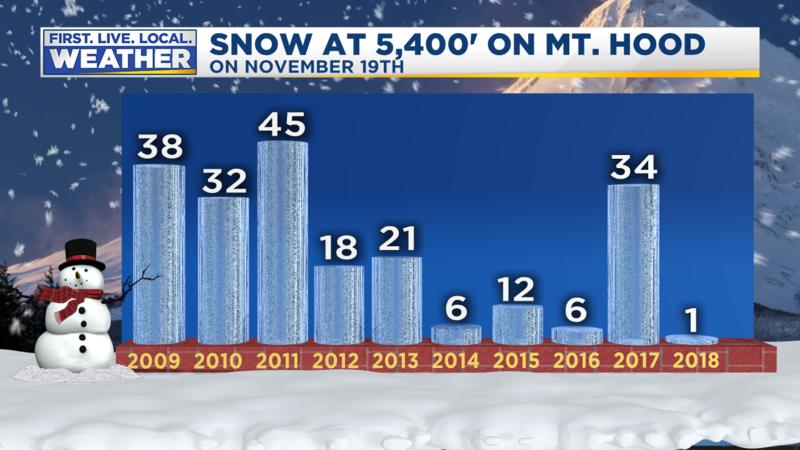 There have only been 3 times the “first snow” has been this late in the season. The three latest “first snow” dates are: November 25th, 1967, December 9th, 1976, & December 11th, 2002. But I think there is a decent chance we get at least some sort of “preview” skiing in by Saturday or Sunday at a resort or two. That’s because we have a (at least temporary) pattern change ahead for later this week. The big ridge of high pressure wants to disappear for awhile beginning Wednesday. We’ll get a very wet system moving inland Thanksgiving Day, then lots of cold showers (snow!) Thursday night through Friday night. Check out the Cascade snow level forecast; you see the big dip late Wednesday and further cooling Thursday night & Friday with those cold showers. Check out the ECMWF snowfall forecast, pretty good isn’t it? A solid 15″ plus above pass elevations around Mt. Hood and quite a bit more for Mt. Bachelor. 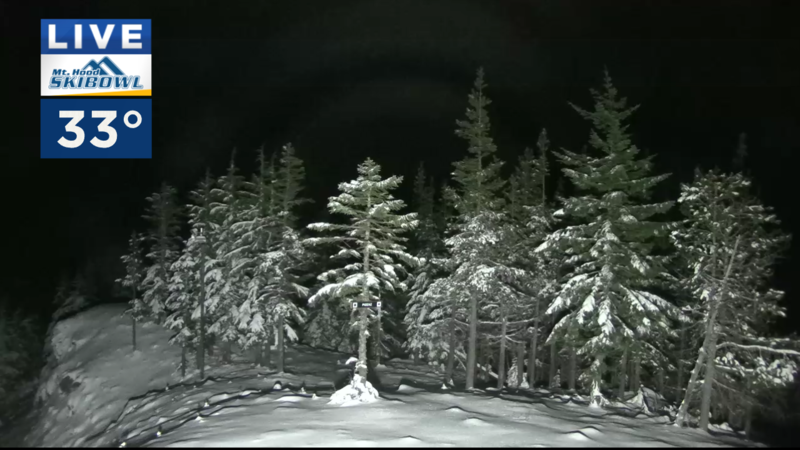 Now in the Cascades you generally need 24-36″ on the ground to get a general ski area opening. That’s because we don’t have smooth lawn-ish slopes. We have boulders, rocks, and creeks to ski over. But recently some ski areas have been experimenting with doing a “preview” or partial opening. That way you get at least SOME time on the slopes even in an early season like this. That makes me think one of those ski resorts may try for some skiing Saturday or Sunday. I remember Mt. Hood Meadows “opening” with 8″ of snow on the ground recently. It’s not like you’re going to be carving up some deep powder of course, but slopes are all white and padded by some parking lot snow shifted onto the runs. A little bit of fun while we wait for the real season to kick into gear. By the way, that has been the trend recently. Snow depth on November 19th at the bottom of Pucci Lift at Timberline. 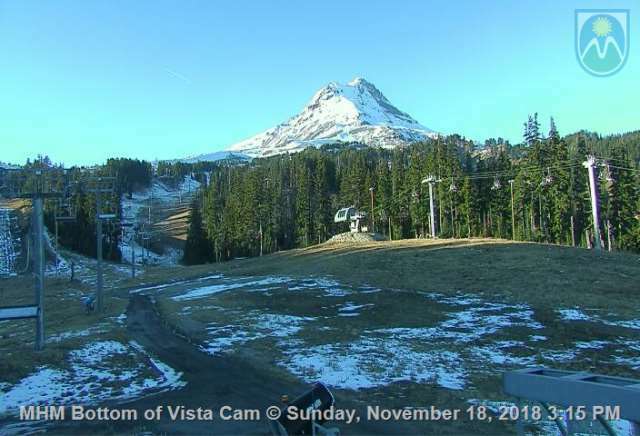 Last year started out with a bang, but then a huge meltdown with record warm Thanksgiving Week weather delayed ski area openings. We’ll see how this year goes. Sunday-Tuesday gave us quite the wake-up call; “East Wind Season” has arrived. We are in a 3 day break (through Friday), but that wind will come roaring back for a longer stay starting Saturday. But you see the cold air (blue colors) gathering to the north? That associated with much higher surface pressure up there. That cool/dry air sweeps south through Eastern Washington and just 20 hours later (Saturday AM) is bottled up east of the Cascades. This is a repeat of what we saw last weekend. Maybe even a touch colder, it’s occurring a week further into the cool/inversion season. Looks like maybe a 6-8 millibar gradient through the Gorge. The 1.33 km WRF-GFS model shows the widespread gusty easterly wind across almost the entire metro area Saturday afternoon. Saturday should be a very windy day across the area. This initial wind Saturday will be a mix of “downslope” and “gap” wind. Expect gusts 30-45 over the hills and east metro, up to 30 mph anywhere else in the metro area. Then on Sunday you can see the typical “gap wind” look to that surface high pressure east of the Cascades. Again about 8 millibars easterly gradient across the Cascades; similar to last weekend’s forecast. At this point the cool/cold air has settled in east of the Cascades and temperatures begin warming overhead. 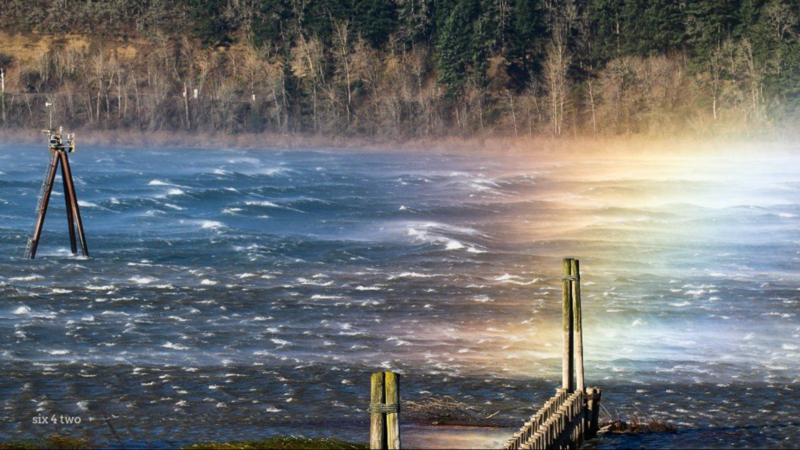 The high pressure has become a “closed high” in the Columbia Basin. You can usually assume the wind will be concentrated more closely around the west end of the Gorge and east metro area at this point. Of course hilltops too. Temperatures will be dropping Sunday-Tuesday in the Gorge & metro area with that chilly easterly flow. Highs will drop into the upper 40s by Tuesday (mid 40s near the Gorge) here in Portland and into the mid-upper 30s in the Gorge. It’ll be a chilly wind once again! This setup continues through at least Tuesday, possibly Wednesday/Thursday too, depending on which model you prefer. 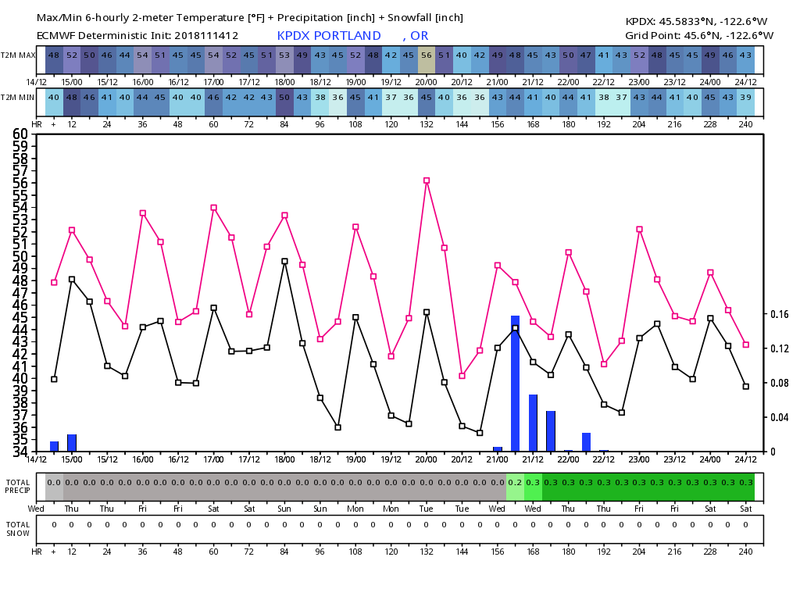 We’ll have to be on the lookout for freezing rain in the central/eastern Gorge again next Wednesday/Thursday if the ECMWF & GEM are correct bringing in precipitation at that time. 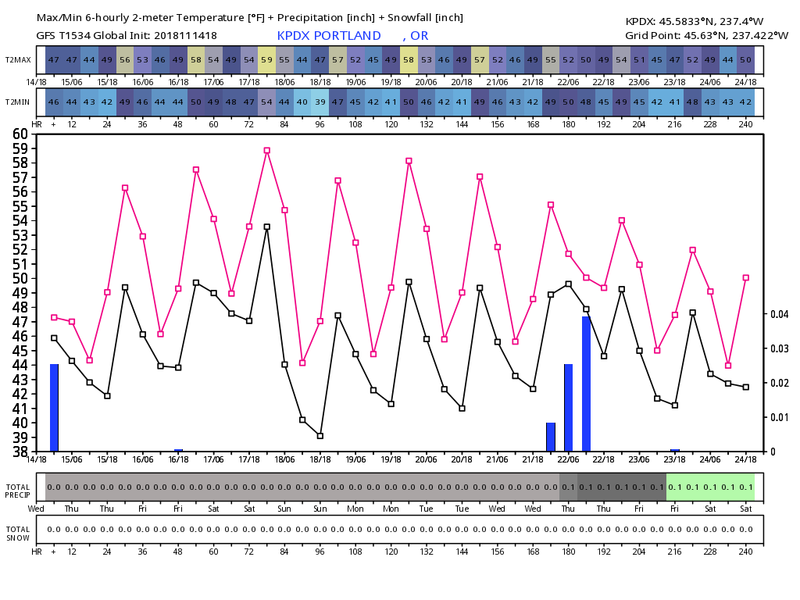 By the way, models are showing a wetter pattern for at least a few days beginning Wednesday. Yet they still look “splitty” and weak. I don’t think we’re entering a big pattern change, but at least we’re headed toward some more normal wet weather for the long Thanksgiving Weekend. 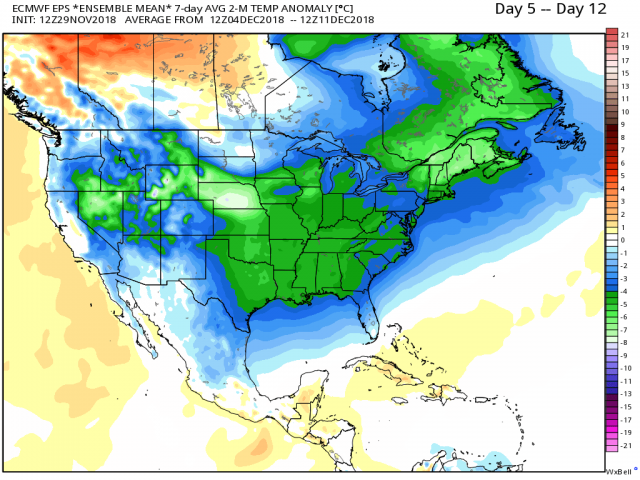 Dry & Mild November; Beginning of an “El Nino Winter”? Sure seems like a slow start to our “storm season” doesn’t it? November is typically a wet and windy month featuring numerous weather systems moving onshore. Not this year! We’re halfway through November and most of the Willamette Valley has seen less than a quarter inch of rain. It’s the 2nd driest 1st half of the month in Portland’s history and #1 driest in Eugene. 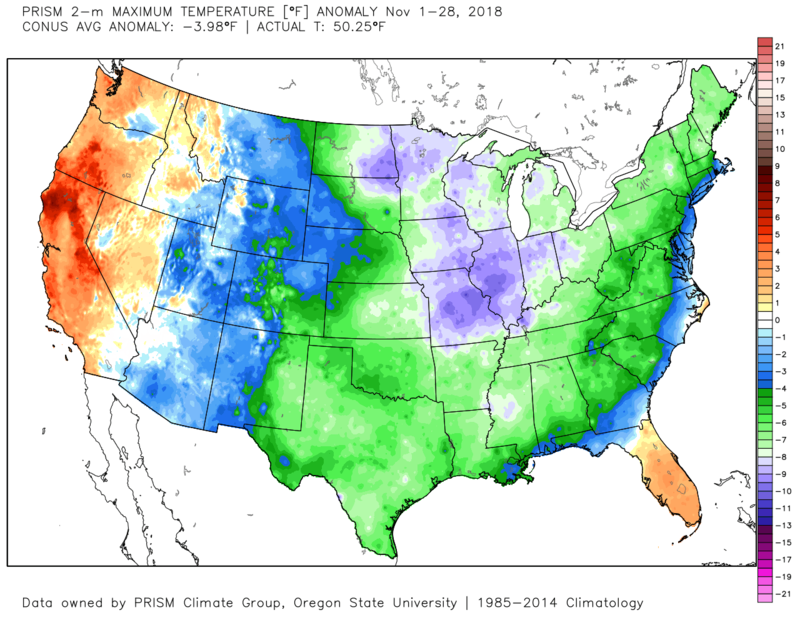 Across the USA it has been a cold start to November with only the Pacific Northwest a bit warmer than average, mainly due to unusually warm temps the first week. We know about the California wildfires; they are being fueled by a late start to the wet season. It’s been very dry across the West, including all of Oregon and a good part of Washington. We’ve been unusually dry because of a persistent ridge of high pressure near, or just offshore the past two weeks. It doesn’t appear that is going to change in the next week or two either. 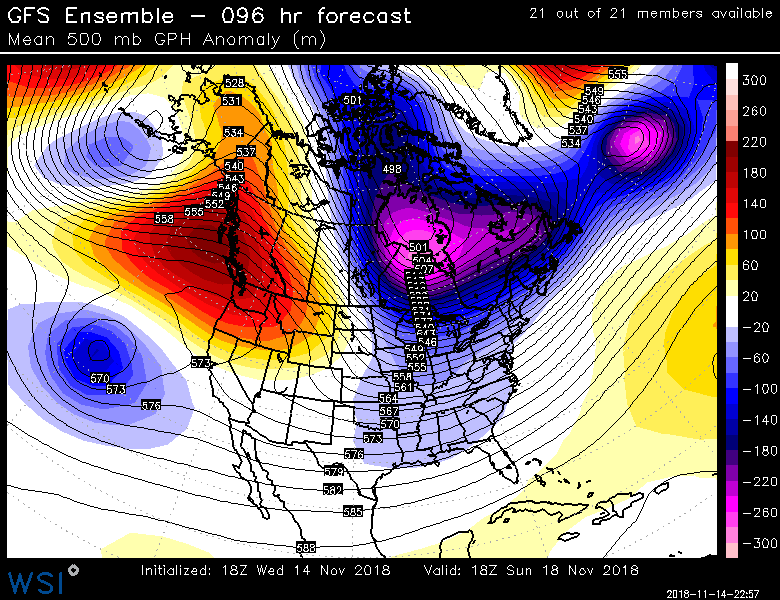 Take a look at the 500 mb (around 18,000′) height anomaly for this coming weekend from the GFS & ECMWF. 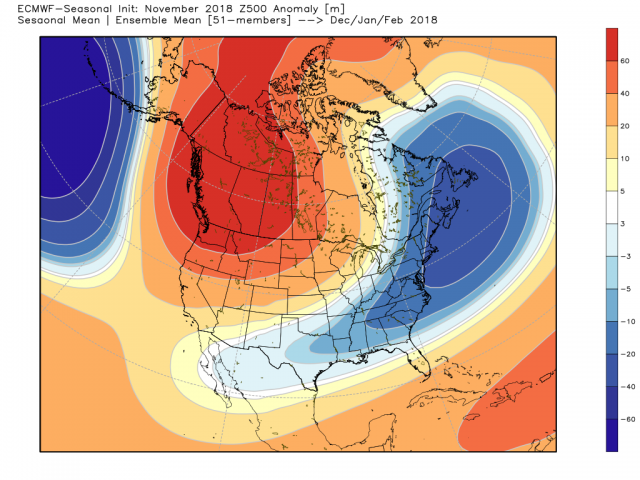 You see the anomalous ridging centered over and north of us, with slightly below normal “heights” in the southwestern USA. 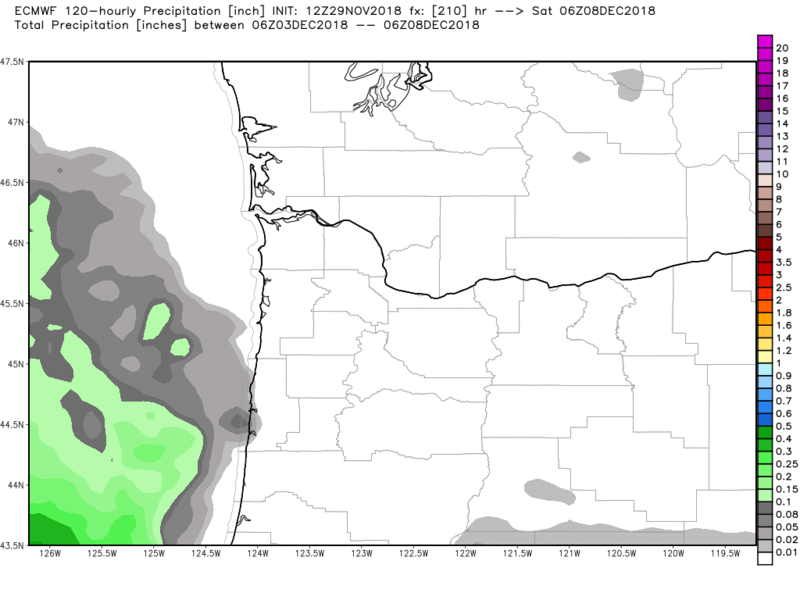 Look further ahead…these two models are slightly different, but neither produces significant precipitation during the Thanksgiving Weekend. The ECMWF & GFS meteograms for the next 10 days. 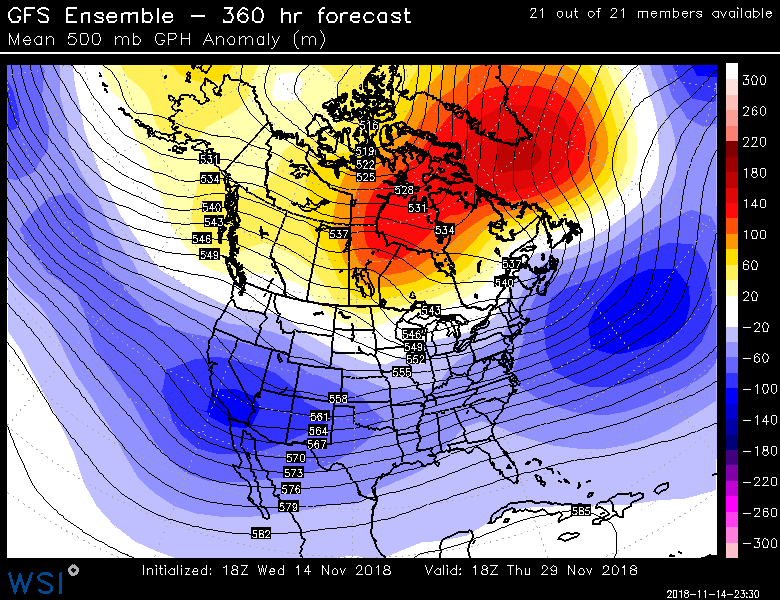 Looking to the end of both model operational runs, the 500mb height anomaly lingers in the same general location. The GFS is a bit different showing a classic El Nino setup with unusually low heights across the southern USA. That can lead to a wet California but drier than average Pacific Northwest. As I look at these runs I wonder if it is the beginning of our “typical” drier than normal El Nino pattern (as opposed to a stormy/wet El Nino). 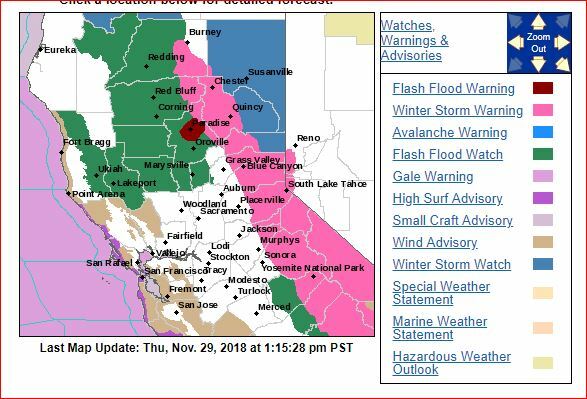 As mentioned in an extensive post about this coming winter (also in WINTER 2018-2019 THOUGHTS tab above), sometimes these years are dominated by this pattern of splitting systems, wet California weather, and just plain boring weather for weather geeks like me. 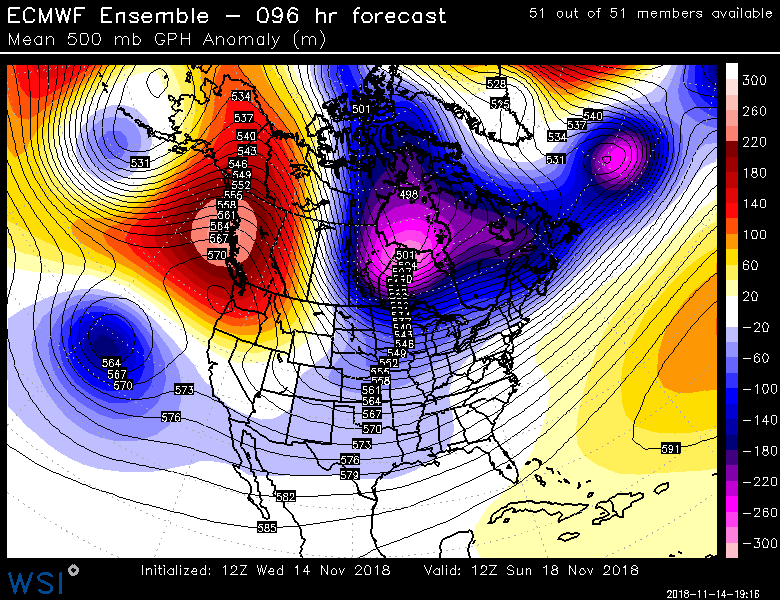 It’s VERY interesting to note the latest November seasonal runs of the ECMWF, UKMET, & JAMSTEC feature this pattern. 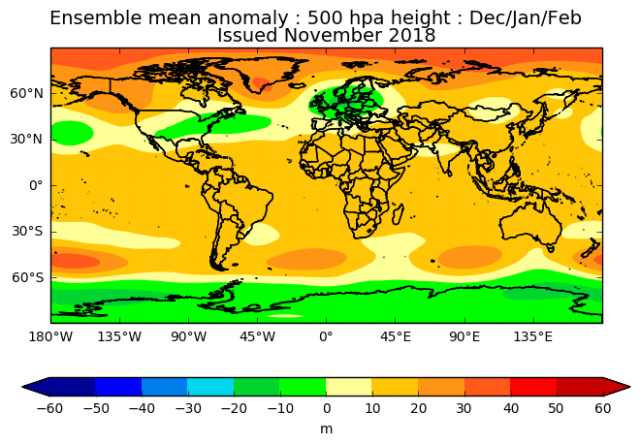 These are 500mb height anomaly for December-January-February. 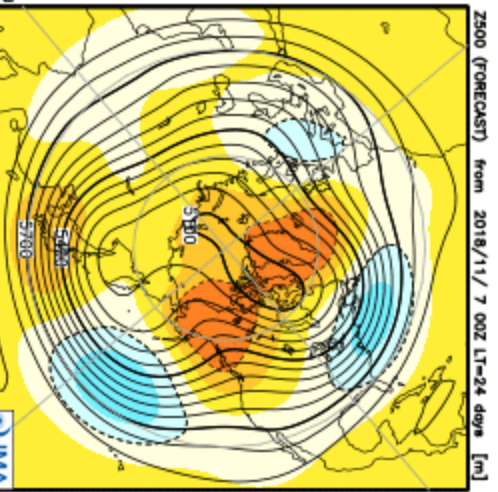 The ECMWF has been showing this winter pattern for at least the last 3 months! We get these seasonal runs once per month. You can probably guess that this is bad news for ski areas for now. There will be no early start to the ski season this year and Thanksgiving Weekend skiing is unlikely. I quickly perused El Nino Novembers for Cascade snowfall. The real shut-out years (less than 20″) most of the time seem to end up as rough ski seasons. Although 1965-66 was a huge snow year after only 15″ at Government Camp in November. 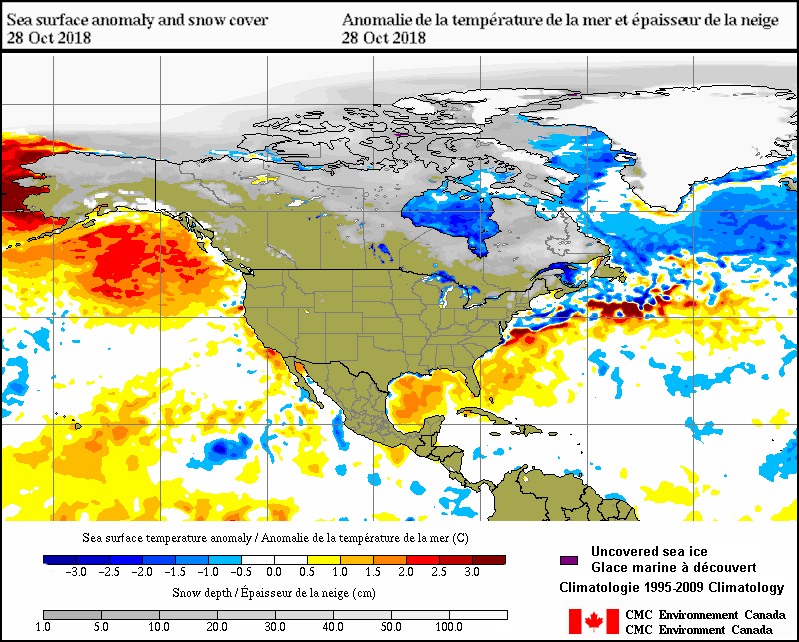 Same thing happened in 1963-64; Only 27″ at Govy in all of November and December. Then 155″ fell in January! A more recent example (although not an El Nino year) would be 2008. Ski areas had little/no snow through the first week of December. Then the big freeze plus tons of lowland snow hit. Ski areas opened about the same time snow fell in the lowlands. It ended up being a big snow year in the Cascades. Lesson? Things can change quickly; FOR NOW there is no reason to freak out. 25 years ago this week I started my television career in Portland. It was my first real TV job and I was lucky to start (and still be in) my home television market. I figured at the time that I’d do it for 5 or 10 years and then “get a real job”. Well…I just kept signing one contract after another and here it is 25 years later; somehow I’ve survived in this tough business. Yes, I have aged. Check out a collection of pics during that time with the dates on the bottom. Actually the first one is from my internship tape at KIRO-TV while at the UW in 1990. I call that the “I’m scared…help me mommy” look. I was 21 years old. No one would hire me because I looked like, well, a little kid, and I gulped and looked scared on the tape, as you see in that first pic above. As a result I ended up taking a job at Micro-Forecasts, a private company that forecast wind conditions in the Gorge. I really liked that job, we moved the office to Hood River (even better! ), and I hoped I would just stay with them for a long time. The 2nd pic above was a brief stint at Columbia Cable in Vancouver doing a couple of hours a day while working at Micro Forecasts. Here’s a pic from 1992. Was it ever okay to wear shorts like that with a shirt tucked in??? Then one day the boss asked me something like “how much of this month’s paycheck do you really need?“. Wow. Not a good sign. Things went downhill after that and the company fell apart. Lucky for me, at the same time both Heidi Sonnen and Bob Shaw (morning and weekend weather) were leaving KOIN-TV; thus KOIN was desperate. I remember coming in for an interview, and Randy Querin, who had been working 6-7 day weeks said “I don’t care if we hire a monkey, I’m tired of this and I hope you get the job”. Apparently I was just barely good enough; I had a real TV job and I was only 24! I don’t have video of my very first day, but anchor Ken Boddie just before the first hit said “don’t worry dude, there are only about 70,000 people watching” , then laughed. Wasn’t funny at that time. By the way, working weekends for about 4 years with Ken Boddie was the best, he showed me what I should and should NOT wear. I was a small town kid with no fashion sense. And, Saturday nights the weather center had the only real nice TV for watching Star Trek The Next Generation…good times. Ken was one of MANY coworkers I’ve been fortunate enough to spend time with over this quarter century. I worked at KOIN-TV for 7 years, then late in summer 2000 I left to be the first meteorologist at KPDX-TV’s 10pm newscast. KOIN had produced that newscast for 8-10 years, then KPDX built the building we are currently in and started their own news department. It was a good time to leave KOIN because soon after things changed. Many owners in the following 15 years included all sorts of layoffs, downsizing etc. I’ve been in the right place with great managers. Then in the summer of 2002, KPDX’s corporation (Meredith) bought/swapped KPTV for another station in Orlando, so both stations were now (and continue to be) owned by Meredith. Lots of layoffs that time too, but somehow I survived. 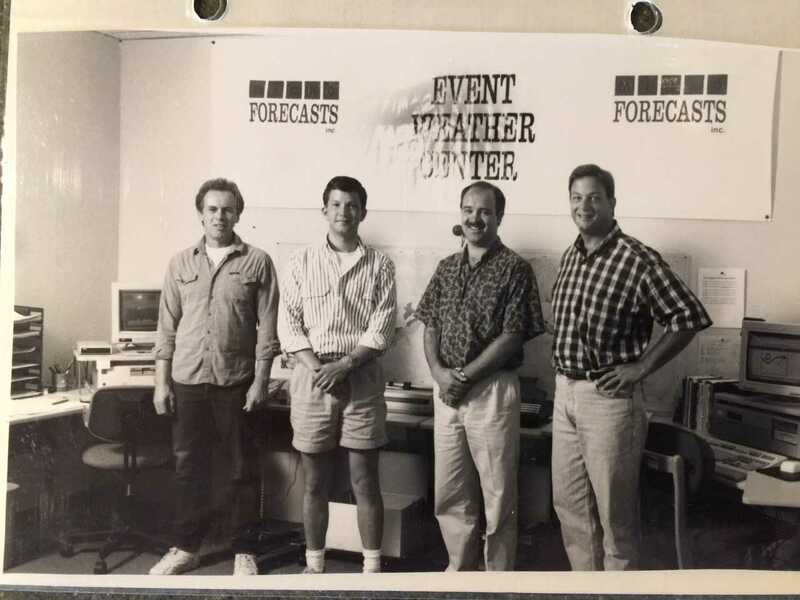 Rod Hill and I were briefly co-chief meteorologists for about 9 months before he left to take a job at KATU when Rob Marciano left. That was good, because we both figured at some point one of us wouldn’t be needed. So how do you survive 25 years in this business? It sure isn’t because I’m beautiful! Part luck, part timing. Being in the right position/place at the right time…many factors play into it. I have seen LOTS of on-air anchors and meteorologists come and go for many different reasons. There are several factors I feel do help out and probably apply to many jobs. Listen up kids! 1. Be FLEXIBLE. Don’t let yourself get steamrolled, but choose your battles carefully! Remember, it’s not brain-surgery, it’s television. Is it really worth ruining a career just because you don’t want to put labels on the high temp map??? Just a real-world example. 2. Treat others well. I’m no angel, but I try to treat others fairly. Don’t make enemies for absolutely no reason. If you’re cranky or unhappy, there is no need to drag everyone else into it. 3. Be willing to learn and adapt. I’m pretty sure I would have been dumped at one specific point if I wouldn’t have simplified my presentation a bit. That doesn’t mean dumb it down (well, maybe a little), but be willing to give a little when a boss comes to you with a new idea. A few times I’ve been approached with what I think is the dumbest new concept. Most of the time I’ve played along. Within a short period of time others discover it’s ridiculous and it goes away. No reason to immediately freak out. Do I still like my job? How long will I keep doing it? Yes, most of the time I like my job. I get tired of the late evening shift (to bed at 1am), it’s always been obvious to me that I’m a morning person. My kids (now 17 & 18) grew up without seeing me 4 days a week, but I tried to make up for that by never doing things on my own weekends and avoiding work commitments on my days off. I still come in most days and stare that the maps/models just like I did 10, 15, or 20 years ago. Each day is new in this business (both TV news & meteorology). Busy winters (like two years back) are very stressful in this business, but anticipating our slow summers with vacation time gets me through those years. That’s what I always tell my wife when I run out of the house an hour after waking up…because 2″ of snow is about to fall on Portland. I’ve had a lot of fun and it’s paid the bills. Plus I get paid to do my hobby…what’s better than that? So I have no plans to leave this odd television news business or FOX12 for that matter. Will it be 30 years? Or 35? We’ll see! 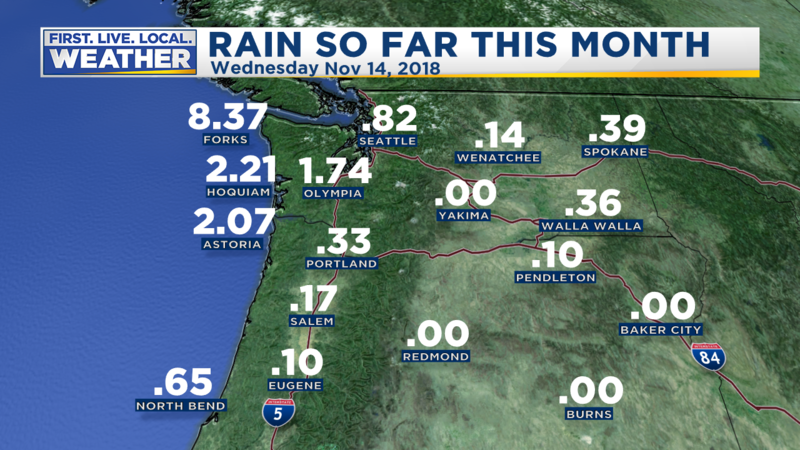 You are currently browsing the FOX 12 Weather Blog blog archives for November, 2018.